Welcome to the third post in our “Featured Tool of the Month” series on Direct Mail! Follow us, as we break down our software, pixel by pixel. Today’s post focuses on the importance of targeted direct mail campaigns through Realeflow. Last week I went through the different mail pieces available in Realeflow’s Direct Mail Marketing Library. Finding the right mail pieces that convert can be time consuming and can burn through a lot of money when you’re trying to find just the right combination of copy, design, and delivery schedule. With Realeflow, we’ve done all the research and testing and have created specific postcard and letter combinations for higher conversion! This week’s post covers the importance of targeting and segmenting lists of real estate leads for your Direct Mail campaigns using Realeflow. First, let’s talk about the different ways to get your real estate leads into Realeflow. 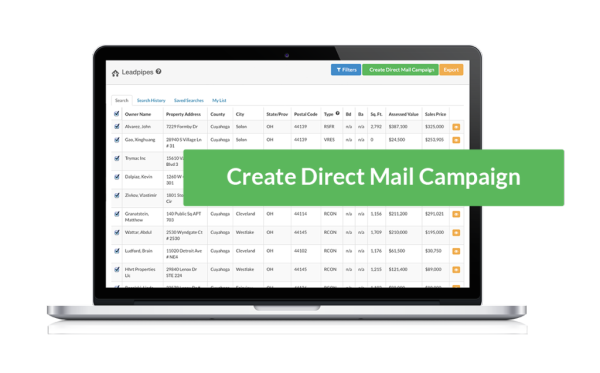 We understand that you may gather leads through your own networking and marketing strategies or through outside list providers, which is why our Direct Mail feature allows you to upload lists of leads with just a few clicks of your mouse. After uploading your list, you simply initiate a direct mail campaign and we take care of the rest. Remember, we work directly with a mail-house that handles all the printing, postage, and mailing so you don’t have to take the time out of your workday to get stamps, lick envelopes, and send mail. *Any list that you import needs to be formatted as a .CSV or .TXT file. Now, if you don’t already have a lead provider, or simply want to incorporate ours into your business, Realeflow provides instant access and the ability to download 10 types of nationwide real estate leads including motivated seller, buyer, and private lender leads. From there, you simply pick and initiate your direct mail campaign. Next, let’s talk about the importance of knowing your lead and how to message them differently. Pinpointing the target lead audience for your real estate investing business is huge. And, while populating large lists of your desired lead type is important, bear in mind that your audience will ultimately dictate how you market the services of your business. The message you send out to your leads should be unique to each specific audience. The goals, wants, and needs of each lead type are different so it’s important to talk to them in a way that connects with them and their current situation. The message to a cash buyer will be very different than a message to a typical homebuyer and the message to a free and clear seller will be very different than a message to an upside down seller. Knowing your lead before you send them a marketing campaign will help with your approach and messaging and will ultimately increase conversion. Once you’ve downloaded your leads from Leadpipes and start the process of setting up a direct mail campaign to that list, Realeflow will automatically know which audience you’re targeting and will provide the correct mail pieces for that audience. If you are uploading a list of leads, and then begin the process of setting up your direct mail campaign, you will choose your target audience and, again, the system will provide you with the corresponding marketing pieces to send to that audience. Then you decide how many touches you want to make and create a campaign that fits your budget. Finally, let’s talk about the differences between single step and multi-touch direct mail campaigns. Single Step – a direct mail campaign that includes a single direct mail piece and is sent out once to a list of leads. These campaigns are typically not very effective for converting leads as the first touch simply gets your name in front of the lead. Rarely do people respond to the first direct mail piece that they get. Multi-Touch – a direct mail campaign that includes several direct mail pieces, typically a combination of letters and postcards, that are sent out in succession to the same list of leads. Campaigns with numerous mailings hitting the same list are proven to generate higher response rates.There is no specific timeframe as to when a lead may respond; it might even take up to a year, or more. But when they're ready, you want to be there. Realeflow provides you with the ability to send out two, three, and five touch campaigns to any leads list. Providing a combination of letters and postcards is also a factor in eliciting an increased response because people are motivated by different mail pieces and messages. Some people will respond to a postcard that they can get short snippets of information from at a glance, while others will respond to a longer letter with more detail. Time and circumstances also affect motivation and response rate. As time passes and prospects see that your business is still around, they are more likely to contact you instead of the real estate investor who sends them a single direct mail piece, never to be heard from again. It’s not unheard of for prospects to contact real estate investors after as much as a year has passed since they received their first mail piece. If you haven’t set-up a direct mail campaign before, don’t sweat it, you’re not alone. With a few clicks of your mouse, you can generate hundreds of leads and create a campaign without ever having to leave your desk! Feel like you need some help? No problem, our Customer Service experts are ready to help you every step of the way. As mentioned before, we have a wide array of mail pieces in our marketing library, all designed to attract the attention of your target audience. We even suggest full campaigns that have been tested and proven to convert the audience that you're targeting. Remember that not every lead will respond to your campaigns, and that’s okay! You can expect to see a 1-2% response rate for your direct mail campaign. Keep in mind that it’s all a numbers game – the more direct mail pieces you send out, the more responses you will get. If one of those leads turns into a deal which nets you thousands of dollars, that one deal is going to pay for your direct mail investment several times over. Ready to set up a Direct Mail campaign today? Start your Free trial here. I’m curious to know what kinds of campaigns you have in place for converting your leads. Do you have a marketing piece that you've found works better than all the others? Feel free to comment below, and be sure to stay tuned for next week’s post as we go step by step through creating a Direct Mail campaign using Realeflow.